A sparkling jewel along the treasure of the Great Ocean Road, Victoria Australia. 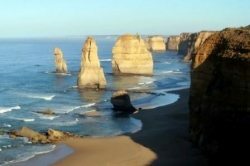 Recognised as one of the world’s most scenic drives, the Great Ocean Road follows the stunning coastline of Victoria’s south-west. Stretching 243 kilometres from Torquay, just south of Geelong, to Allansford, just east of Warrnambool, the road winds along cliff tops, up to breathtaking headlands, down onto the edge of beaches, across river estuaries and through lush rainforests offering panoramic views of Bass Strait and the Southern Ocean at every turn. Experience and enjoy the natural environment on horse back or on a mountain bike. A permit is required for horse riders to ride in the National Park and Parks Victoria staff can assist you with this. The formed roads and tracks provide ideal trails for these active endeavours. The 12km mountain bike loop linking West Barwon Reservoir and Lake Elizabeth is suitable for mountain bikers with moderate levels of fitness and experience. There are excellent camping opportunities throughout the Parks. Whether you are looking for a family friendly place to park your caravan or a solitary night under the stars there's something to cater to every need. Picnic opportunities abound, with lovely settings at many of the waterfalls as well as Blanket Leaf, Sheoak, Distillery Creek, Moggs Creek, Paradise, Melba Gully, Shelly Beach, Triplet Falls and Blanket Bay to name a few. The stretch between Lorne and Apollo Bay is considered by many to be the most picturesque section of the Great Ocean Road. The highway is carved into sheer cliffs that drop away into the ocean, offering commanding views of the waves swelling and crashing onto the rocks and beaches below. Outside Apollo Bay the road winds through the centre of the Great Otway National Park with its beautiful untouched rainforests, before returning to hug the coast for the entire length of the Port Campbell National Park. 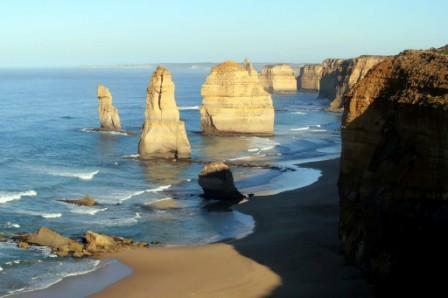 This is the most famous section of the Great Ocean Road featuring an amazing collection of rock formations known as the Twelve Apostles which have been carved out of the headland by the fierce waves of the southern ocean. The fine golf course in Lorne has magnificent views overlooking the town, ocean and pier. 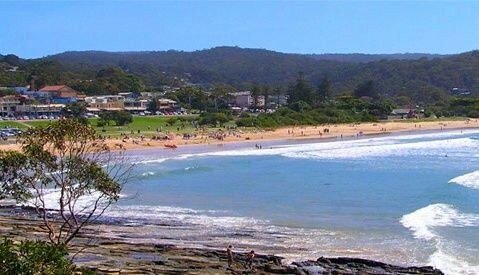 Lorne's beach has beautiful sand, crystal blue waters and fantastic scenery. Whether it is an afternoon stroll with the whole family, or a challenging multi-day hike there is something to suit everyone. Separate brochures are available from local Visitor Information Centres with details on the variety of walks available. Here are just a few. An 8.5 kilometre drive from Lorne on the Erskine Falls Road; this is one of the most popular falls in the Otway’s. An easy walk brings you to an overlook of the falls cascading 30 metres into a beautiful fern gully. Moderate walk down steps to base of falls. Contact reception for a local map. A 4-kilometre, 90-minute strenuous return walk from Blanket Leaf picnic ground, off Erskine Falls Road. The beautiful Cora Lyn Cascades flow over a series of exposed shale ledges. Moderate 2.5-kilometre, 90-minute return walk to spectacular falls along the St Georges River from the Allenvale Road car park, 2 kilometres out of Lorne. Moderate 1-kilometre return walk to the falls from the car park, 3 kilometres south of Lorne, off the Great Ocean Road. Takes about an hour but there is a falls view within 10 minutes walk of the car park. While not falling for a great distance, the water passes over a dark rock face within a natural amphitheatre, making for spectacular viewing. Moderate 8-kilometre return walk from the Sheoak picnic ground, off Allendale Road. Approximately 3.5 hours return. Tall rainforest trees and dense tree ferns fringe the falls. 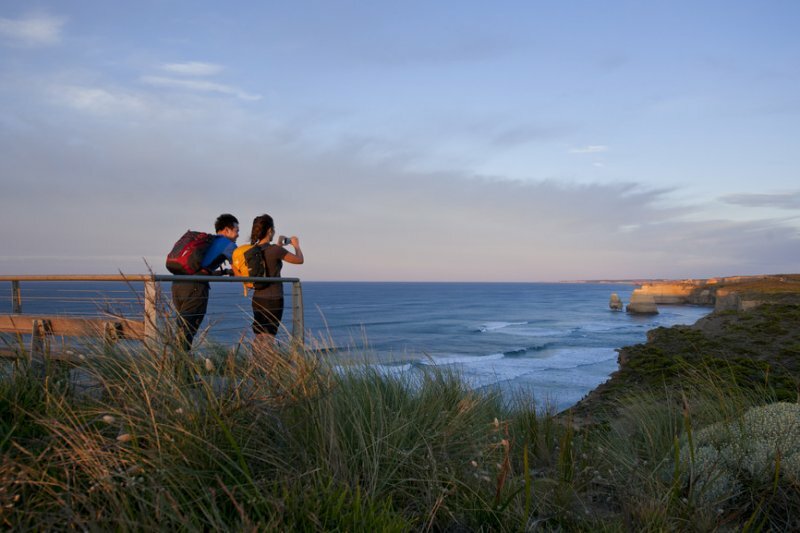 The Otways represent the tall wet forests, ancient rainforests, the drier forests of the inland slopes and the very diverse heath-lands and woodlands, fringed by a spectacularly rugged coastline and studded with some of Victoria's most striking waterfalls and other attractions. Please take care and check track conditions with the Visitor information Centre before setting off. A moderate 1 hour return loop walk. Located 20 minutes east of Lavers Hill, this magnificent waterfall is reached via the Lavers Hill-Beech Forest Road. A 1.8 kilometre return walk takes in the falls, three broad cascades set in a ferny rainforest of stately Myrtle Beech trees. Toilets and picnic tables are available. Moderate 1 hour return walk from the picnic area. The walk passes through magnificent mountain ash forests, with large myrtle beech, blackwood and thick ferns. The track becomes steep before opening to the spectacle of the falls crashing over a ledge into a large pool. Located off the Aire Valley Road from Beech Forest Road. Viewing platform at the car park offers a view of the roaring water as it pounds into the Aire River. Alternatively take a 30-minute return moderate walk to the falls. The path is steep to the valley floor where it passes through a glade of tree ferns to the foot of the falls. The Aire Valley is a short distance south, offering a beautiful area with a backdrop of towering Californian Redwoods. Located 26 kilometres east of Lavers Hill off Aire Valley Road. Moderate 2 hour return walk through magnificent fern gullies and mountain ash forests, highlighted by a viewing platform elevated seven metres in the canopy overlooking the Little Aire Falls. Located off Lavers Hill-Beech Forest Road. An easy to moderate, 40-minute return walk. Located at the end of the Barham River Road, with a large car park. You will cross over large stepping stones at 4 creek crossings and view Magnificent tree ferns, lichens and mosses, with a close view of the falls. Note: Track is subject to flooding at times, take care after rain. An easy 1-hour return walk. Located at Barramunga off the Skenes Creek-Forrest Road, take a 7-kilometre drive down a dirt road to the camping area. Turn right and park at the boom gate. A hardened surface walking track (approximately 20 minutes) takes you to another picnic ground beside the Gellibrand River. Cross the river and follow the track to the falls (10 minutes). The final section of track to the falls can be slippery after rain. During dry weather you can drive to the second picnic ground for a shorter walk (turn left as you enter camping area). Do not attempt to cross the river after heavy rain or in peak flows. Facilities available; Toilets, picnic tables and wood fireplaces. 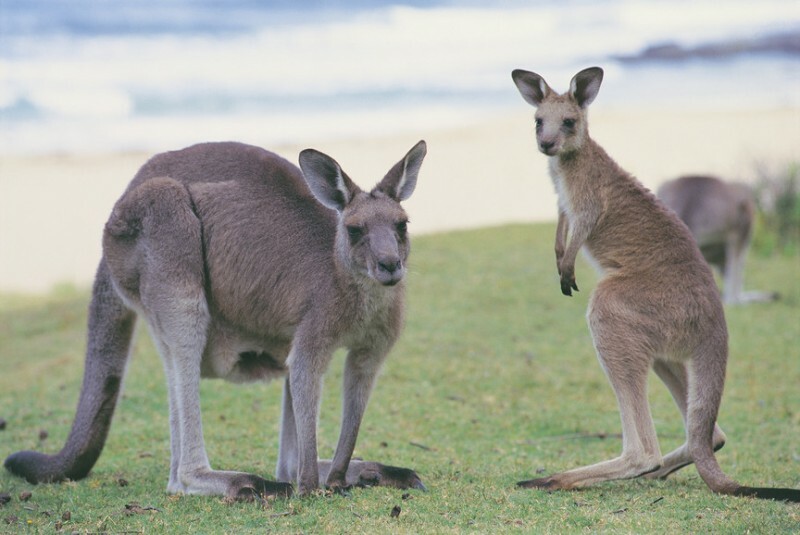 For further details and more things to do whilst you are in Lorne and the Great Ocean Road please contact the hotel reception.